The Historic Villages of Shirakawa-gō and Gokayama are one of Japan's UNESCO World Heritage Sites. The site is located in the Shirakawa river valley stretching across the border of Gifu and Toyama Prefectures in central Japan. These villages are well known for their houses constructed in the architectural style known as gasshō-zukuri (合掌造り). The Gasshō-zukuri, "prayer-hands construction" style is characterized by a thatched and steeply slanting roof resembling two hands joined in prayer. The design is exceptionally strong and, in combination with the unique properties of the thatching, allow the houses to withstand and shed the weight of the region's heavy snowfalls in winter. Minka (民家 "house of the people") are houses constructed in any one of several traditional Japanese building styles, were the dwellings of farmers, artisans, and merchants. Minka are characterized by their basic structure, their roof structure and their roof shape. Minka developed through history with distinctive styles emerging in the Edo period. The houses are large, with three to four stories encompassed between the low eaves, and historically intended to house large extended families and a highly efficient space for a variety of industries. The densely forested mountains of the region still occupy 96% of all land in the area, and prior to the introduction of heavy earth-moving machinery, the narrow bands of flat lands running the length of the river valley limited the area available for agriculture and homestead development. The upper stories of the gasshō houses were usually set aside for silk farming, while the areas below the ground floor were often used for the production of gunpowder. The primary purpose of shaping minka roofs in this manner was to accommodate the extensive precipitation experienced in many parts of Japan. A steeply peaked roof allows rain and snow to fall straight off it, preventing water from getting through the roof into the home, and to a lesser extent preventing the thatch itself from getting too wet and beginning to rot. An Ocha-ya (geisha tea house) on the Shirakawa river in the Gion district of Kyoto. The Shirakawa River is a river flowing into Kyoto prefecture of Japan and a tributary of the Kamo River. Its name means "white river" in Japanese, due to the fine-grained white sand that it carries from the hills east of Kyoto. 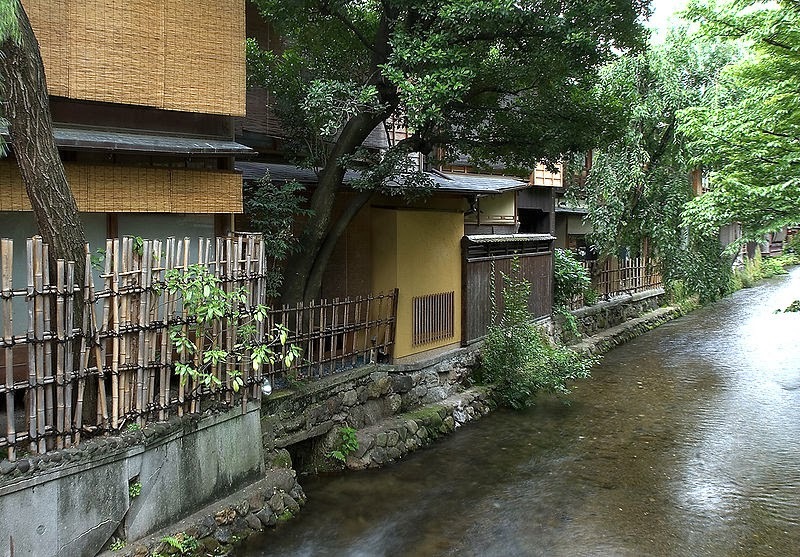 Directly before entering the Kamo River, it passes through the geisha district of Gion, where many traditional establishments, such as ocha-ya (geisha tea houses) and restaurants, line the river.